One of Disney’s less known, but also one of their best syndicated cartoons to emerge in the early 90’s was TaleSpin, which was literally originally written as a DuckTales spin-off. Ultimately the writers decided to ditch the idea of casting Launchpad McQuack as the star pilot of the show – he later got a supporting role in Darkwing Duck, also an essential cartoon – and decided to replace him and a few supporting characters with the cast of Jungle Book. Though ratings varied, TaleSpin was indeed a good, consistent show and ran for a glorious year on cartoon primetime. 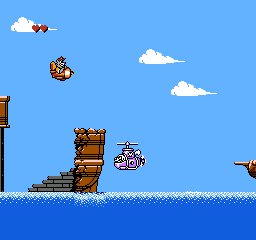 Capcom had already immortalized DuckTales and Rescue Rangers as video games, in 1991 – once again, after the show’s abrupt end – it was TaleSpin’s turn to conquer home consoles. The game pretty much flopped, due to the irrelevancy of the license at the time, but also due to lackluster gameplay. Apparently Capcom wasn’t Disney’s golden goose, after all. Baloo is hired to deliver important cargo to all parts of the world. The evil businessman Shere Khan is bent on putting Rebecca, Louie and the bears out of business, so he sends Don Karnage and his air pirates after Baloo and his cargo. The game looks surprisingly generic, taking into account how good the earlier Disney/Capcom works turned out graphically. There's also a lot of empty space, which on the other hand guarantees a smooth framerate. I can't help but feel that Capcom wasn't full on with this game's production, it's like something they just had to do. The merry jingles they call background music are just plain boring. Let's get one thing straight right away: I liked this game a lot as a kid, but I certainly don't know why. I was really excited to play the game again, and I really thought this review would turn out completely different. 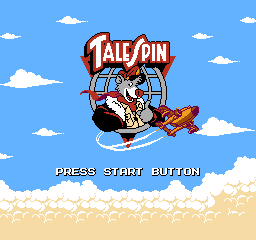 Back in the day TaleSpin was one of the only side-scrolling shooters I played on a regular basis. The chosen genre for this game is absolutely all right. Of course it has to be a shooter, it just wouldn't work as a platform game. There has to be a plane in TaleSpin. The controls are very simple, but the response ain't too shabby. You control Baloo's plane, the Seaduck, in automatically side-scrolling stages, and in bonus stages, you control Kit and his airfoil. There are several items you can pick up, such as extra cargo and cherries and general stuff that really doesn't make any sense, and only adds to your totally irrelevant score. There are enemies all around and you must fire some sort of projectiles – I guess they're bullets, although they look like grey gumballs – to dispatch them. You can flip the plane over to shoot the enemies behind it, and pretty much move in all directions. The controls, topped off with some really annoying aspects of general gameplay, are horrible. It's very hard to dodge enemies and their attacks, 'cause despite the ability to move in all directions, the movement is very stiff and tied to a certain pattern. The moving in itself is pretty easy to cope with, but then comes the problem of shooting. Now, this is a shooter, so why do we have problems with rapid fire? I'm totally serious: the rapid fire is very random. Sometimes you can fire more than one shot within a certain period of time, sometimes you can't. Usually your shooting speed is very slow, and in boss fights, this seemingly little quirk will turn out fatal, believe me. The boss fights are pure hell, as if the standard enemies and the measly maximum health weren't enough to make your blood boil. Adding to the frustration are the random, solid obstacles that might trap you between themselves and the invisible wall on your left side. Sometimes it's impossible to know whether you can get stuck behind this or that wall or obstacle, or not. It's so random. The game isn't too difficult, just frustrating as hell - remember the bosses above all else - and there are a few tricks you can use to your advantage on many occasions, helping you towards eventual victory, if you can bear the game that long. TaleSpin can easily be summed up using one word: rental. That is, if you're interested at all. It pretty much depends on what you think of the show. I'm starting to believe the only reason I liked this game so much younger was the show. The TaleSpin TV show premiered in 1990 and ran for one season. The game was released after the show had already been cancelled. Two more, unrelated games based on TaleSpin have been released: an action game by Hudson Soft, released on the TurboGrafx-16 in 1991, and a platformer by Sega, released on the Genesis/Mega Drive and Game Gear in 1992.